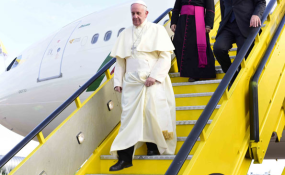 Pope Francis on a visit to Uganda (file photo). On Saturday 16 March, the Holy Father Francis received in audience His Excellency Mr. Salva Kiir Mayardit, the President of the Republic of South Sudan, who subsequently met with Cardinal Secretary of State Pietro Parolin, accompanied by His Excellency Msgr. Paul Richard Gallagher, Secretary for Relations with States. During the cordial discussions, the good bilateral relations were highlighted, as well as the contribution of the Catholic Church in the fields of education and healthcare, and in the process of reconciliation and the reconstruction of the nation. Attention then turned to matters regarding the implementation of the agreement recently reached by various political actors, with a view to a definitive solution to the conflicts, the return of refugees and displaced persons, and the integral development of the country. In this context, His Holiness expressed the wish to ascertain the conditions for a possible visit to South Sudan, as a sign of closeness to the population and of encouragement for the peace process. Copyright © 2019 Vatican Press Office. All rights reserved. Distributed by AllAfrica Global Media (allAfrica.com).